Wow! That was my first impression when I opened up the box containing Georges Méliès: First Wizard of Cinema, a thick boxed set with five DVDs filled with the inovative French director's films! 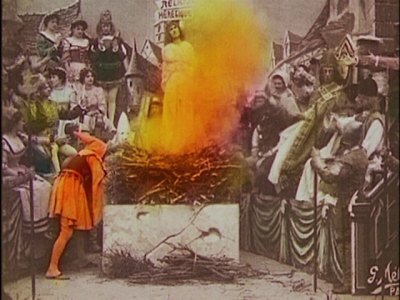 Flicker Alley in association with David Shepard and Blackhawk Films has scoured the globe to put together an amazing collection of 173 films that Méliès made between 1896 and 1913. All told, films from seventeen archives and collections were used making this as near a complete collection of existing Méliès works as were ever going to see. It seems almost impossible to have this many of his films together at one time. A truly unprecedented endeavor, Flicker Alley has spared no expense in making this a truly collectible item. 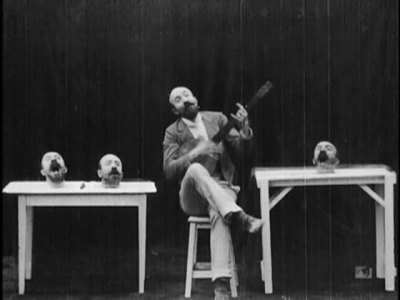 George Méliès accompanies three of his heads on the banjo. George Méliès started life as a magician. He owned the Robert-Houdin theater in Paris, started by the famous prestidigitator whose name it bears (and whose name a young Erik Weisz would adapt for his stage name: Houdini), and preformed there regularly. In April of 1896 Méliès started incorporating movies into his theater's program of evening entertainment after buying a projector from England. (Attempts to purchase cameras and projectors from the Lumiere Brothers, the first to screen movies in France failed.) Later that year he started making movies himself, filming outdoors. When the fickle elements became too much trouble, the young magician constructed the world's first movie studio, which was completed in 1897. About this time a serendipitous accident occurred that would influence the rest of Méliès film career. While he was filming candid life scenes outside of Place de l'Opera in Paris, his camera jammed for a moment. When the problem was fixed he continued shooting. After developing the film and screening it Méliès discovered something that must have been amazing to him: a trolley in the background instantly turned into a bus. He had accidentally stumbled upon trick photography and many of his films afterwards would use such manipulation to make some amazing films. The set starts off with his first film, a short actuality, Playing Cards (1896), and ends with his final effort, 1913's The Voyage of the Bourrichon Family. In between are over 170 amazing films of all types. Even when seen today these films are both imaginative and pioneering. It's impossible to determine what the audiences of the 1890's and early 1900's thought of his magical fantasies, but they couldn't have been any less impressed than viewers of today. One of the things that these films all show is Méliès vast imagination. At the time that he bought his first camera, movies were only used to document life. A train pulling into a station, a lady dancing on a stage, and the recording of firemen rushing to a fire were typical films of the time. Méliès first film, Card Party, was in that vein, a group of friends playing cards and talking about stories in a newspaper, but he had soon expanded the medium far beyond that. In the third film in this set he's making a woman disappear, turn into a skeleton, and then reappear by simply stopping the camera. In the fourth film, A Nightmare, he's firmly embraced the fantastic, having a man be tormented by a giant moon that tries to eat him. This short was made in the same year as Card Party. It is simply astonishing to see how far Méliès progressed in just a few short months. Viewing these films it soon becomes apparent that Méliès never stopped trying to top himself. Though he (and other filmmakers who copies him) gets a lot of use out of stopping the camera and rearranging the sets, he wasn't satisfied with just that gimmick. He came also used multiple exposures, moving backgrounds, masking, and other in-camera techniques for creating magical images. A lot of these shorts are surreal; with devils and demons instantly appearing and disappearing, people spontaneously walking up walls or ripping off their own heads, and size is only temporary. Though he's best known for his dream and magical fantasies, Méliès also made historical dramas, comedies, adaptations of popular fiction, and reenactments of famous events. These are all presented in this collection and it's easy to tell that they are Méliès' work. All of his films have a certain flavor, with intricate backgrounds, large sets, and breakneck action. It was certainly the hectic pace, with one amazing thing happening after another, and large elaborate sets which enticed viewers around the turn of the century. It's also what led to his ruination. The later films presented in this collection form the early teens are still inventive and clever, but they don't differ significantly from his work a decade before. Conquest of the Pole (1912), Méliès last great film, illustrates this point. It's an entertaining and creative film that is a lot of fun. A group of scientists debate the best way to get to the North Pole and several expeditions are launched including ones by car, balloon, and plane. The latter is the only one to make it to the Arctic where the explorers have some adventures including being attacked by an ice giant and getting stuck to the "Magnetic Needle Axis of the Pole." Like his other movies, and this one bears a close resemblance in structure to A Trip to the Moon (1902), the special effects trump the story. In this case the bizarre cars that try to drive to the pole and the constellations that the plane flies by are all interesting to look at, but they don't advance the story and are on screen for too long. The film didn't do well at the box office and one has to imagine at least part of the reason is that people had seen it all before. Borrowing money to upgrade his studios Méliès became heavily in debt. Though his last films were longer, the times had passed him by. Audiences wanted longer narratives and fewer gimmicks. When his films stopped making money and his notes were called George Méliès was forced to leave the industry that he helped to create. It has been said that Méliès made over 500 films during the course of his career, but it's astounding that this many still survive. Over the years several large caches of his films have been destroyed or disposed of, making most of his work lost to time. It's sad to hear but in 1917, at the height of WWI a collection of his films were discovered in the Passage de l'Opera which was being occupied by the military. They melted the celluloid in order to extract the silver content and fashioned the rest to boot soles for the fighting soldiers. Six years later his theater was demolished and the films stored their sold be weight. Finally in 1924 Méliès himself burned his collection of his works to make more room for his family in their small apartment. But time has not claimed all of his films and these 173 movies are a good look at what the French magician was capable of. Entertaining, fun, and whimsical, these films are well worth watching. Having said that they go down best when viewed a few at a time. Screening an hour's worth of these films can get a bit monotonous, though a few shorts every evening keeps them fresh and enjoyable. This 173 (!) film set comes on five DVDs which are housed in a fold out book which comes in a slipcase. There is also an informative 36-page booklet included with the set. More details on the booklet are in the 'extras' section. All of these films are with music preformed by some of the most noted names in silent film accompaniment. Eric Beheim, Brian Benison, Frederick Hodges, Robert Israel, Neal Kurz, The Mont Alto Motion Picture Orchestra, Alexander Rannie, Joseph Rinaudo at the Fotoplayer, Rodney Sauer, and Donald Sosin all contribute pieces. Being a critic, I hate to say that they were all good, but I can't recall a single theme that was distracting or didn't make the film more enjoyable to watch. I really enjoyed all of the scores. Pieces that stick in my mind include Mont Alto's accompaniment to The Conquest of the Pole and the music for The Good Shepardess and the Evil Princess played by Donald Sosin. Of course these stick out because they are longer pieces and were on the last disc. 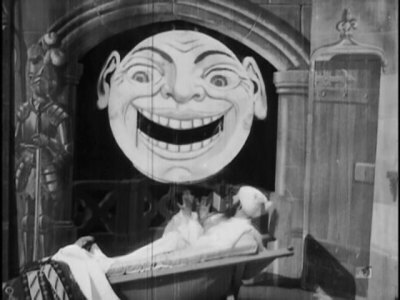 Some of these films also have narration, in English, which was written by Méliès and was intended to be read aloud during the screening of the films. Serge Bromberg (of Lobster Films) and Fabrice Zagury provide the voices and they both do a splendid job. This narration (over music) is very important and several films would be unintelligible without it. In the Skipping Cheeses, for example, a woman dressed in a white apron and white sleeves gets on a trolley. It's only through the narration that we're told she is wearing the traditional outfit of a cheese-seller, and that her wares are very malodorous. Without that information the rest of the film makes no sense. The quality of these films varies quite a bit, which is only natural given the large number and age of these movies. It's amazing that these survive at all, and so every print is special. What's more, a good selection of these films are hand tinted and the colors are strong and solid making those films even more amazing to watch. There are a variety of defects that are apparent over the course of the set natuarally, but none of the films are unwatchable and many of them look excellent. The average presentation in this set comes with some light scratches and possibly a missing frame. The contrast is a little weak, and whites and dark areas tend to hide details. This is an amazing set overall and the video quality is just fine. The set starts out with a nice featurette: Le Grand Méliès. This 1953 French film, which runs about 30 minutes and is narrated in English, is an enjoyable if somewhat idealized look at the life of the innovative film-maker. It includes an appearance by his wife, who started in many of his early films, and the role of Méliès himself is played by his son, Andre. 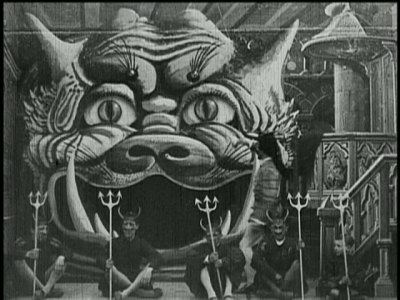 There are some interesting examples of magic lantern slides that Méliès drew and presented at his theater where he also appeared as a magician. 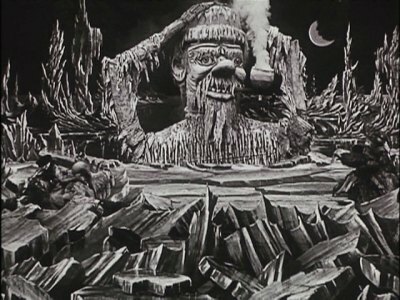 The movie also recreates Méliès filming some of his shorts as well as featuring vintage clips. This is a nice introduction to the man and his legacy. There is also an informative 36-page booklet with essays on Méliès, stills from his films, and a thorough listing of the movies in this set. This list not only contains the titles, but also the catalog number of the movie, the production year, run time, and even the genre of the movie; an excellent reference for both the casual viewer and the serious film scholar. This is attention to detail is what makes this such a wonderful collection. Run out and buy this collection. It isn't going to be in print forever, and wouldn't you rather buy it now and support the publisher than pay twice as much a few years from now on e-bay? Watching the films creates the same sense of wonder that audiences must have felt a century ago. Even when seen today these films are both imaginative and pioneering. Flicker Alley, David Shepard, Jeffrey Masino and everyone else who had a hand in the production of this amazing set did a magnificent job. This set belongs in the DVDTalk Collector's Series.